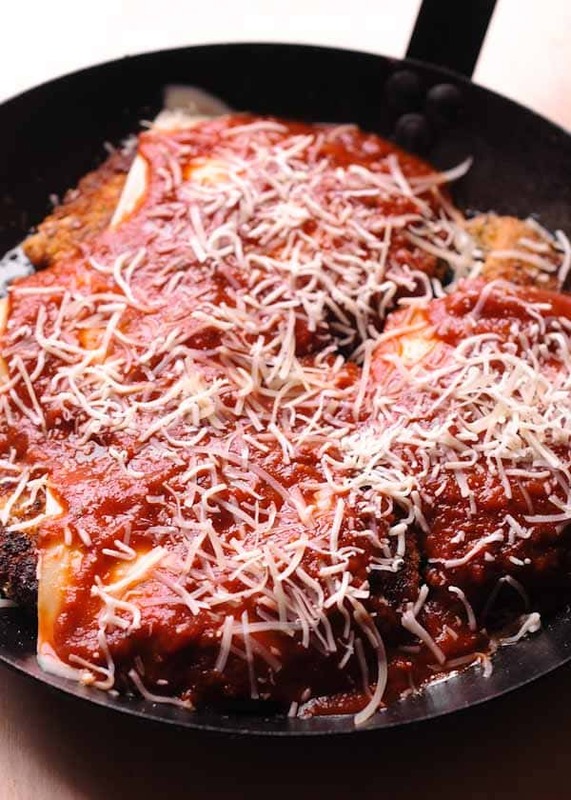 Authentic Italian Chicken Parmigiana - What's In The Pan? Aaahhh, cheesy Baked Chicken Parmesan. It’s one of our family’s favorites along with Parmesan Crusted Chicken. I remember making it for the first time years ago and wondering why it took me so long to try it! 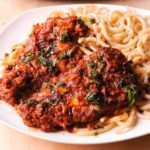 Well, it’s about time I share an easy Chicken Parmesan recipe for those of you who prefer an easy weeknight dinner. A good Chicken Parmigiana does require quite a bit in the way of seasoning and shredded cheese, but I’ve kept things super simple in this recipe. This classic Italian-American food doesn’t get much easier than this! In this authentic Italian recipe, a fried breaded chicken breast is topped with marinara sauce and melted cheese. The coating is very crispy and easy to prepare! First, you will need to coat the chicken. In order to do that, prepare 3 wide plates, or bowls. 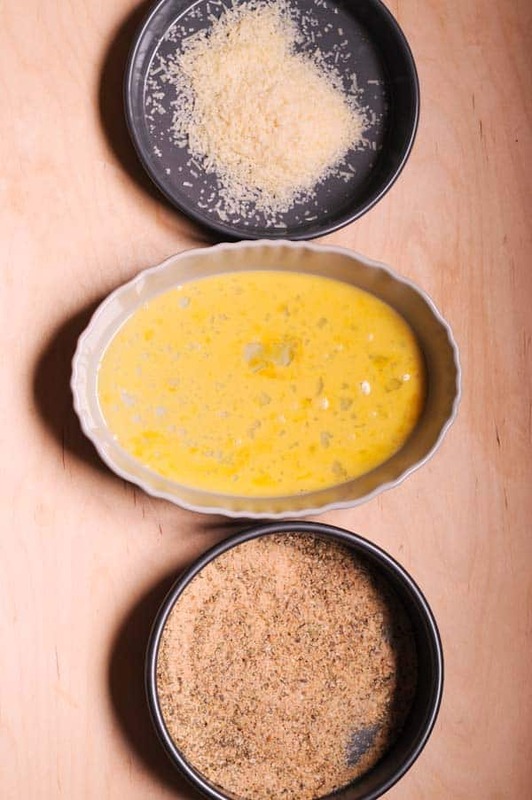 One for Parmesan, the other – for whisked egg and third one for seasoning mixture. Be generous with seasoning! Then you will pan-fry the chicken. 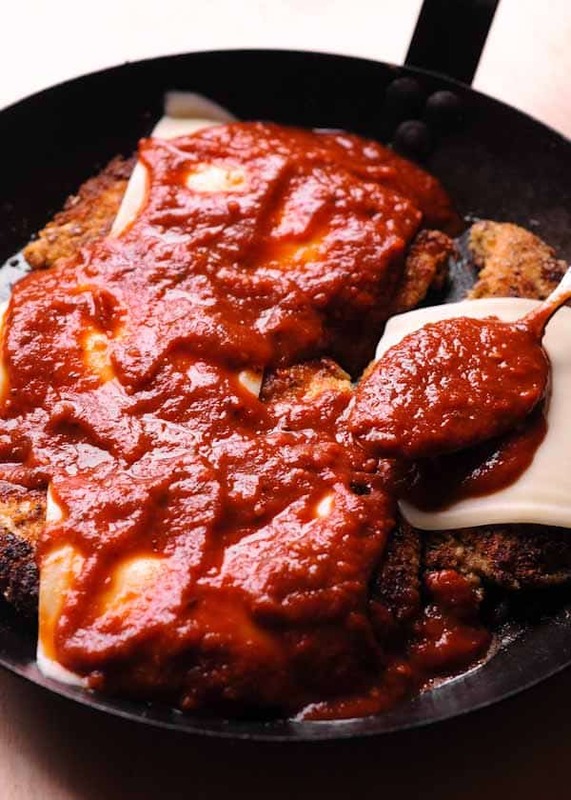 Once chicken is browned, you will layer it with Mozzarella cheese and marinara sauce. Delicious! Lastly, bake it in the same pan for about 30 minutes and then serve it with fresh basil. These easy chicken breasts coated in Parmesan and Mozzarella cheeses are the perfect easy dinner to serve on busy weeknights. Done! These easy chicken breasts coated in Parmesan and Mozzarella cheeses are the perfect easy dinner to serve on busy weeknights. For chicken parmesan you can use either chicken breast or thin chicken cutlets. The difference? While the chicken breast is large and thick, a chicken cutlet is a slice of meat cut from a chicken breast. It is much thinner than the whole breast. If you do not wish to use breadcrumbs, you can substitute with almond flour, cracker crumbs, old-fashion oats, or crushed corn flakes. I also saw some stores carry gluten free breading crumbs made from chickpeas. I recommend that you prepare 3 wide plates, or bowls. As you can see, one is for grated Parmesan, the other – for whisked egg, and the third one – for seasoning mixture. Next you will coat chicken cutlets by dipping each chicken breast in every bowl/plate. You will then pan-fry these coated chicken breasts. Once they are done, layer them with Mozzarella cheese and Marinara sauce. 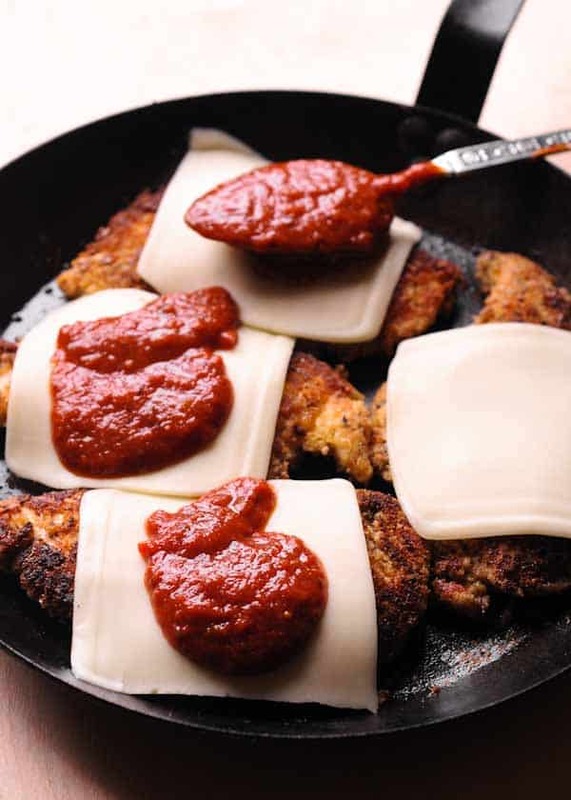 Of course, you can also top the chicken cutlets with the sauce first, and cheese on top, but I found that cheese first method makes Chicken parm taste juicier. I added Mozzarella slices first and spooned the tomato sauce next. Sprinkle with shredded cheese. 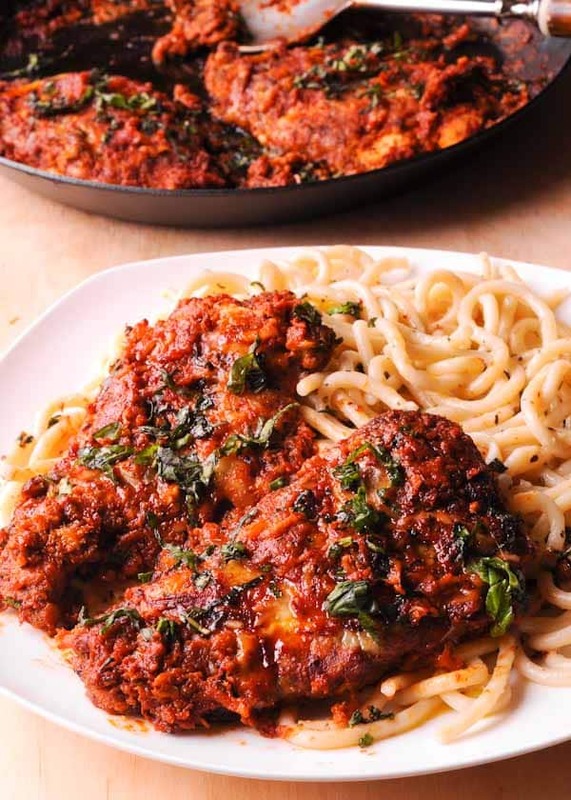 Lastly, you will bake your chicken parmigiana in the same pan for about 30 minutes and then serve it with fresh basil. Because chicken breasts have a mild flavor, they need to be generously seasoned to impart enough flavor. 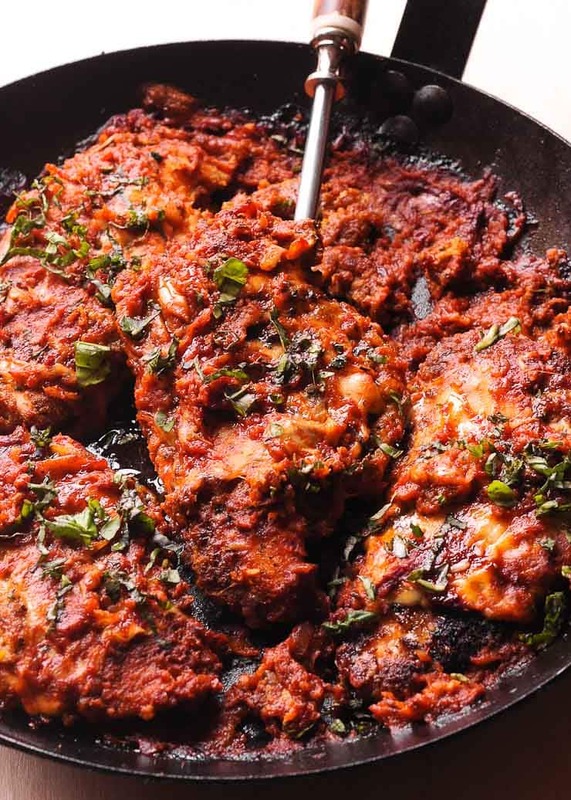 For this easy Pollo Alla parmigiana recipe, I seasoned the chicken with plenty of Italian seasoning, salt, pepper, and garlic powder. AT WHAT OVEN TEMPERATURE TO BAKE CHICKEN PARMESAN? For this recipe, I bake the chicken breasts in a 375 degrees oven. 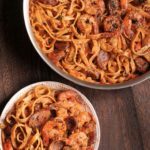 It makes for a deliciously filling Sunday dinner and the best part is that it is ready in under 40 minutes! What should I serve with homemade Chicken Parmesan? While the simple chicken parm is great on its own, adding pasta truly makes chicken parmigiana a full, complete meal! This combination goes all the way back to the first Italian immigrants. Once settled in a thriving America, they discovered that the ingredients for the marinara sauce were abundant. So they paired these foods with another widely available Italian food: spaghetti. That’s why today many people automatically think of chicken parmesan as a pasta dish. I also frequently make this classic Italian dish into a Chicken Parmesan sandwich. A crispy breaded chicken cutlet is placed between a nice crusty bread and topped with classic Marinara and cheese! 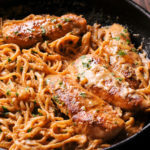 Underneath all that bubbly cheese, you will bite into a tender chicken breast. Well, what can you say? This homemade Chicken Parmesan recipe produces the most succulent, tender, juicy and flavorful chicken breasts! Perfect for sandwiches! 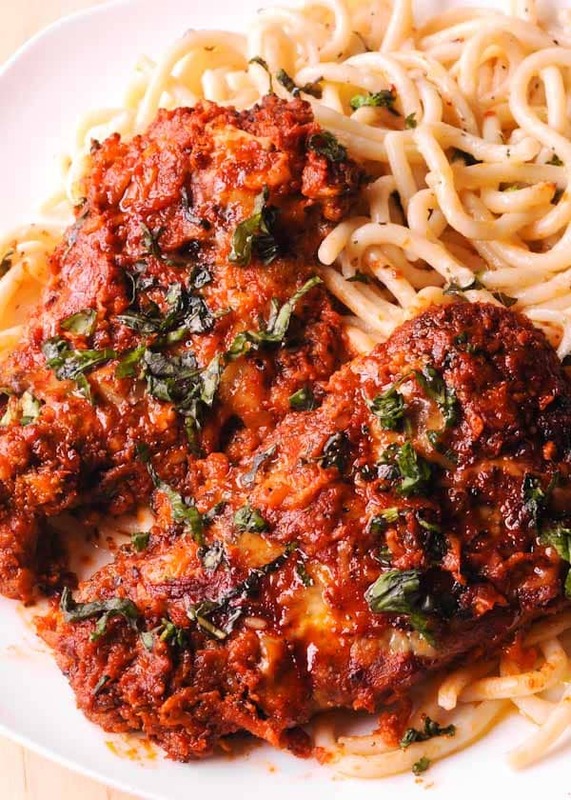 Once you taste this Authentic Italian Chicken Parmesan, you must try Italian Chicken Pasta as well! And for dessert, I highly recommend Panettone Bread Pudding. Authentic chicken parmesan is an easy chicken dinner! Set up a line of 3 bowls or wide plates. Place 1/2 cup fo grated Parmesan in a large plate or bowl. In another medium bowl, whisk the egg. In the third bowl mix together bread crumbs, Italian seasoning, garlic powder, salt, and pepper. Bread the Chicken: Dip chicken cutlets in the Parmesan bowl and coat on both sides. Then, transfer coated chicken and dip in egg on both sides. Last, dip both sides of chicken in bread crumbs mixture. Evenly coat and pack breadcrumbs lightly with your hand. Shake off any excess breading and repeat with the remaining chicken. 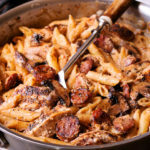 Sear the Chicken: Heat olive oil in a large cast iron skillet or pan and brown chicken for 3 minutes on each side, fora total of 6 minutes for both sides. I browned 2 chickens at a time. 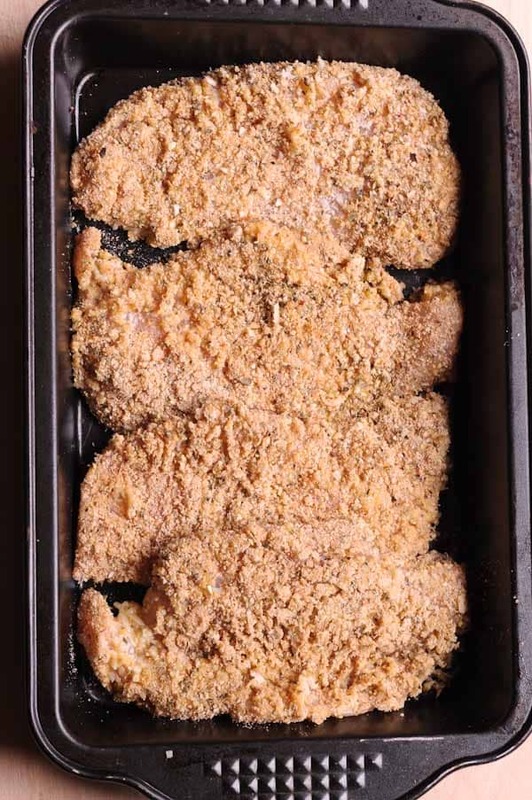 Bake Chicken: Preheat oven at 375 F. Lay browned chicken in the same oven proof cast iron skillet (or a baking dish). Layer chicken with mozzarella slices. Then add marinara sauce over top. Scatter shredded Mozzarella and remaining 1/2 cup of Parmesan on top of Marinara. Bake for 30 minutes until sauce is bubbling, about 30 minutes. Sprinkle with fresh basil and serve with spaghetti. Easy to follow recipe and delicious. Delicious!! 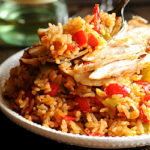 I loved it and it was an easy recipe to follow ! Thank you Leanne! It’s one of our current favorites! I made this yesterday and it was delicious ! The recipe is perfect – thanks so muc! Are you calories per serving or overall?